ContactGrabber - Capture Contacts and Addresses into your addressbook with a click! Use ContactGrabber for saving leads & contacts with one mouseclick from e-mails, websites or other text documents. 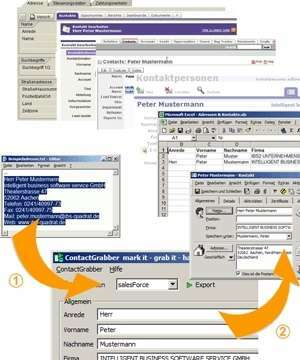 ContactGrabber works with Outlook, Excel, SAP, salesForce, MS-CRM, ACT!, vCard,vtiger, sugarCRM, LotusNotes, Outlook Express. ContactGrabber 3.6.1 is a shareware program and can be used as a demo to try the software until the free trial period has ended. A full version of the program is available after the trial period ends. For security reasons, you should also check out the ContactGrabber download at LO4D.com which includes virus and malware tests. Additional screenshots of this application download may be available, too.